Knights of Creativity Spirit & Ale: Which Way Alice? Where do you want to go? What do you care about? Answer these questions and enjoy the planned and unplanned journeys that life brings! Today, I bury the last of the "Greatest Generation" Baker's, my Uncle John. Tomorrow I point my rental car towards the Rocky Mountains and unknown vistas. Saturday, I play my guitar and sing at Mass. 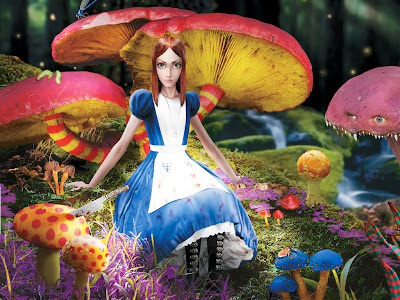 Sometime soon I will see the new Alice In Wonderland. Last July I walked where the author of this famous story walked. Sunday? Who cares! Good excerpt. Never has a book been so full of gems, and yet so nearly wasnt written. When Tim Burton, Johnny Depp and Helena Bonham Carter get together I am never disappointed. Throw Lewis Carroll into the mix and how can you go wrong? Sooo looking forward to this movie. Seems like the confectioners Rowntree, have pick up on your theme of random adventures....with a competition in their Random Sweets. Sir D, looks like a future post there.